Hunting trips for us often also mean a fun camping trip for our family. We’ll commonly find a campsite near where I want to grouse hunt, pack up the vehicle with all our gear, and spend the weekend outdoors. While it means an opportunity for some quality family time, it also unfortunately typically equals a very full vehicle. If it was just me going I wouldn’t be bringing all that stuff, but any man that has ever been camping with his family before knows that just isn’t a discussion you want to get into. Enter vehicle cargo racks, otherwise known as cargo hitch baskets! I’ll break down the best hitch mounted vehicle cargo baskets we’ve come across to help you make an informed decision on which one to buy. Like my dad always told me – “Keep it simple, stupid!” – Vault Cargo Management’s cargo hitch carrier certainly isn’t anything over-the-top fancy but the second you grab onto it you know it’s solid as all heck! 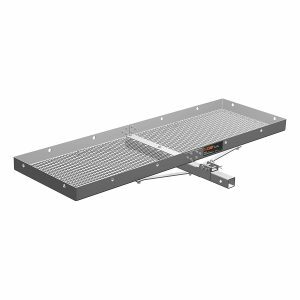 With a 60″ x 24″ frame welded out of 1″ steel tube & an expanded metal floor, this sucker is everything you need and more. Vault Cargo Management lists a rated capacity of 500 pounds, which should be more than enough if you’re strapping down a cooler & a couple of bins. The carrier also comes with a bent shank to help get your gear over your exhaust, and also holds the basket relatively tight to the vehicle. While this might not seem like all that big of a deal, it actually makes the unit stronger since your gear will be closer to the support. Not sure if this was intentional on Vault’s part or not, but either way it’s a feature that I like about it. This is our go to carrier for everything from camping, to hunting, and even for moving. We also actually pair it with their waterproof cargo hitch bag, which protects our gear from moisture & keeps our stuff clean from all the grit of the road. It’s held up well during our trips and comes at a very reasonable price. Note: It looks like most of Vault’s items are slightly cheaper on their own websiteÂ than they are on Amazon. If you don’t need Amazon’s 2 day prime shipping, I’d recommend checking there. 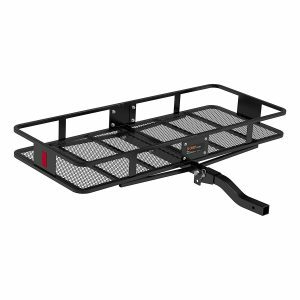 If you are looking for a vehicle cargo rack with an option for a folding shank, you may want to look towards Curt’s cargo carrier. While I don’t personally care for the folding shank on my vehicle cargo racks (the engineer in me worries about a weak point where it swivels), I know there are many that do. Curt’s unit is quite similar to Vault Cargo Management’s for the main part of the basket, but the reason it falls a bit short is due to the shank. As I mentioned before, the closer the unit is to the vehicle the stronger the unit itself. It’s pretty clear from the pictures that Curt’s vehicle cargo racks are positioned quite a ways from the receiver, and it is super apparent when you actually start loading the basket. If you’re a fan of Curt’s and want to stick with them this certainly isn’t a bad option. It will definitely get the job done, but I feel there are one or two shortfalls here. 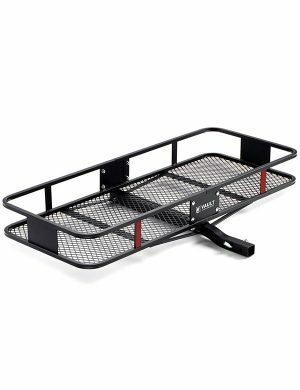 You can check prices for Curt’s vehicle cargo rack here. We’ve gone over a couple more standard steel options, so I figured I’d throw a wildcard in here. Enter the MaxxHaul aluminum cargo carrier with the folding ramp. This is a nice little option if you have some heavier gear to throw up onto the carrier by yourself. 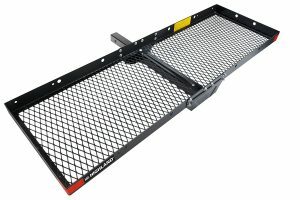 The ramp is pretty well made, and all-together it ends up weighing roughly the same as a standard steel cargo hitch carrier. One major note about the ramp though is that it’s likely going to entice you to load it up over capacity. While the capacity might not seem like all that big of a deal when you’re loading it up, it is an entirely different story when you’re actually on the road. With each dip & bump in the road these carriers see a significantly larger amount of stress when they’re loaded, so you’re going to have to be careful. You definitely sacrifice a bit of space with the ramp, but if it’s something you’re looking for this is definitely a good option! 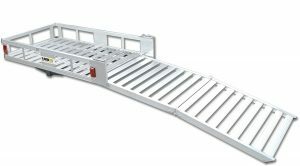 You can check prices for MaxxHaul’s cargo carrier with folding ramp here. By far the lightest option we’ve got on the list, Curt’s aluminum tray-style cargo carrier is a nice little option if you’re heading camping for the weekend. 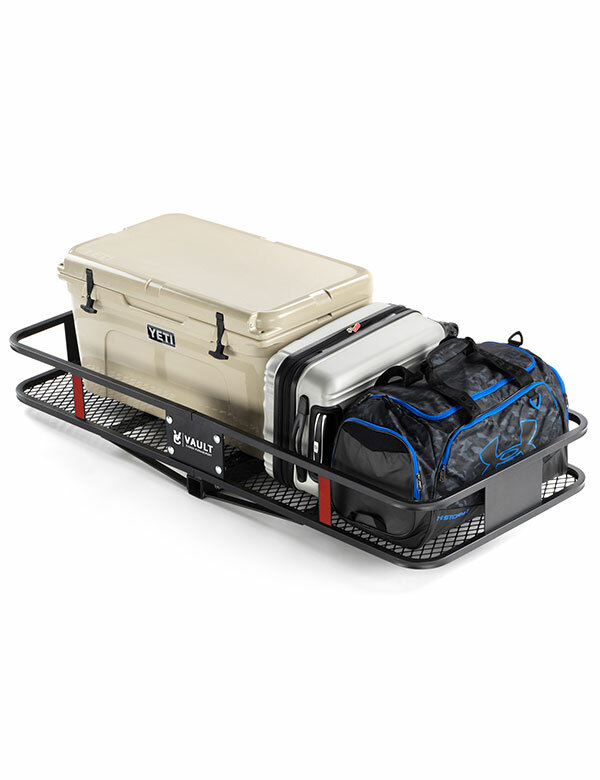 I’m personally a fan of having side rails to contain my gear and have a more secure anchor point to tie down to, but if you are in the market for a lightweight tray-style cargo carrier this is probably what you’re looking for. Like the other Curt unit on this list, this tray-style cargo carrier also has a folding shank. I won’t go into how I feel about that again, but if that’s something you’re looking for it’s certainly a nice little option. In my opinion the folding shank makes a lot more sense for this tray-style cargo carrier than the basket style. You can check prices for Curt’s aluminum tray-style vehicle cargo racksÂ here. While the quality isn’t quite there on Highland’s steel tray style cargo carrier, it does make for a very budget-friendly option if you only need to use it once or twice. I’ve seen these hauling deer more than once driving down the road, and they seem to do just fine. Not many bells and whistles to this, but it definitely gets the job done. Functionally this is right up there with most other vehicle cargo racks, but like many Highland products we’ve tried it seems like they tend to cut corners to save money at times. Not to say that’s a bad thing, but if you’re looking for something to last you a long time you may want to look elsewhere. That being said, if you only need it for one or two road trips this could be a great option for you. You can check prices for Highland’s steel tray-style vehicle cargo racksÂ here.